Sept. 14, 2009 -- Arkansas State University-Jonesboro will host an exhibit on the life and achievements of U. S. Senator Thaddeus Caraway in the lobby of the Dean B. Ellis Library, 108 Cooley Drive, Jonesboro, from Tuesday, Sept. 22- Wednesday, Nov. 25. An opening reception, sponsored by ASU’s Department of Political Science, will be held at 3:30 p.m. Tuesday, Sept. 22, and will include comments by Paul Austin, executive director of the Arkansas Humanities Council and an Arkansas State University alumnus. The opening reception, like the exhibit itself, is free and open to the public. The exhibit is among the university’s Centennial Celebration activities and is part of a collection of traveling exhibits sponsored by the Arkansas Humanities Council. The exhibit, funded by the Arkansas Humanities Council and University of Arkansas-Little Rock professor Cal Ledbetter, was researched and created by the staff of the Butler Center for Arkansas Studies. 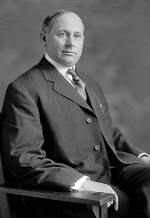 Senator Thaddeus Caraway of Jonesboro served as a U. S. representative from 1913 until 1921 and as a U. S. senator from 1921 until his death in 1931, when his seat was filled by his wife, Hat tie Caraway. Both Senators Caraway were progressive champions of the poor and vigorously aided the people of Arkansas during the Great Depression. The Dean B. Ellis Library’s doors open at 7 a.m. Monday-Thursday, and close at 1 a.m. On Friday, hours are 7 a.m.-6 p.m.; on Saturday, 10 a.m.-6 p.m.; and Sunday, 2 p.m.-1 a.m. The Dean B. Ellis Library will be closed Saturday-Sunday, Nov. 21-22. For more information about the exhibit, contact ASU’s Centennial Celebration Office (centennial@astate.edu), (870) 972-2803.